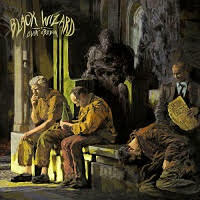 BLACK WIZARD is back with a new album titled “Livin Oblivion”. This powerful Metal album with some Rock thrown into the mix is some hard driving music. Any Metal enthusiast would be proud to not only listen to this unique mix but see them on tour. From the first song to the last song this will rock your ears. Below is the track list with a little about each song. “Two of these nights” has great guitars from the beginning! Great drumming throughout. This song can be described in one word – Wonderful! For all the die-hard Rock and Metal heads out there, this will be a total delight to the ears. The guitars in this song is something to be heard by many of the masses. Very nice gentlemen, well done. “Feast or Famine” is the first single from this album. First singles from albums usually set the tone for albums. The album title refers to the idea that we live in an age where there is a decay of one’s self, morals, and life. This song is a great way to begin this album with this oblivion we live in. The pace of this song can remind one that life moves fast and it keeps moving. The guitar solos are a force to be reckoned with. The vocals match the angst and how upsetting life can be at times. There is good drum work throughout. Nice song to head bang to. “James Wolfe” has a softness to that can only be described as relaxing Rock’n’Roll. It is simply beautiful. “Livin’ Oblivion” is the track name as well as the album title. A dark gritty sound from the beginning. It goes fourth into flat out good Metal. This track does the album title justice. “Cascadia” is a slower mix with almost a Bluesy feel underneath. This is my kind of song. A great song to enjoy your favorite beverage to in a relaxing bubble bath. One of those songs that is just enjoyable. This is a different sound than the first five songs on the album but it has become my favorite overall. It is the undertone of Blues, I love Metal but, I do love the Blues as well. This will be played quite a bit over and over by this woman. “Portraits”: Just the name of this song reminds me of all those tattoo artists that do great portrait tattoos, I do not know why, but it does. This is a nice unique Rock song, maybe horror movie directors should take note to this song. This would be great in a film. A creepy vocal with a bit of an echoing sound is wonderful. This song again has the undertones of Blues in it. “Poisoned Again” is heavy, heavy, heavy and that is the only way to describe this song. It is short but heavy. It is great Metal in a riotous way. It is almost a love song in a strange way. “Heavy Love” is a loud, guitar driven song that is a great one to head bang to. I enjoyed this masterpiece. In “Eternal Illusion” I love the beginning guitar and drums, they are pleasurable. Again, a gritty song that is wonderful with heaviness that shows talented musicianship and artistry. If you are looking for just a good Metal song, then look no farther. When listening to this album in full, everything blends well. It is produced well and it is lyrically solid in its concept of what is going on in the world today. “Livin Oblvion” is a good Metal album that is a nice surprise from a Vancouver band that has went through a few line-up changes since 2016, when their last album was released. It is refreshing to know Metal and Rock is not dead.